We’ve been hearing a lot about photo search recently, and with the huge abundance of images shot, almost every photographer now finds it a challenge to organize and manage burgeoning photo collections — no less locate the exact shot they’re looking for. Photo apps like Flickr, Google Photos and PhotoTune — employ complex algorithms that can either recognize specific objects in your photos or otherwise categorize and classify your images in various ways to help out with that task. The newest entrant into this arena is PicJoy from HitLabs, an iPhone app launching today, that automatically organizes your photos via visual and contextual clues. Auto tagging — some items are not helpful. 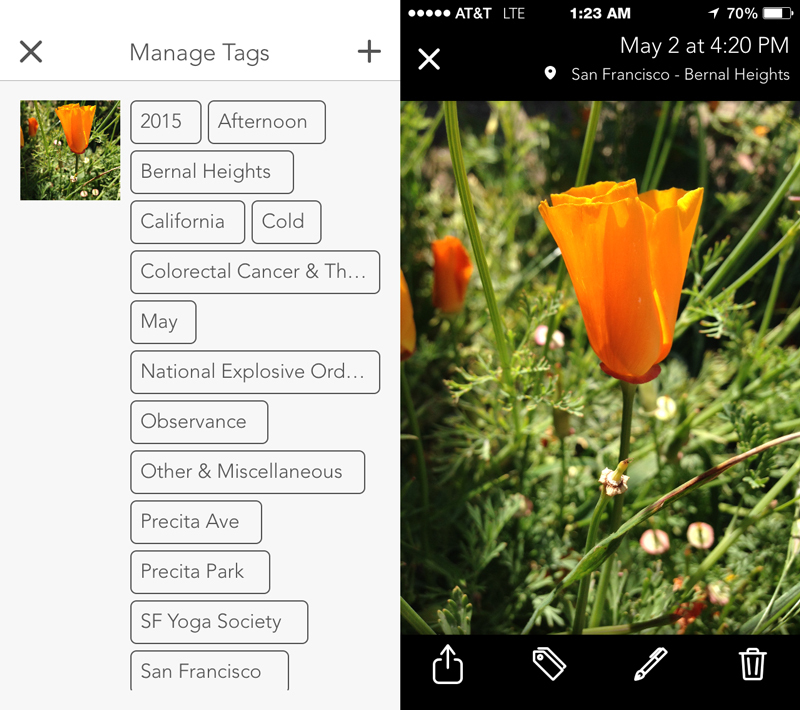 As a deep-learning organizer, PicJoy automatically tags images on your iPhone and in your iCloud account and lets you sort photos based on location, date and context. PicJoy’s automatic categorization feature gathers information like date, season, weather, holidays, events and landmarks. 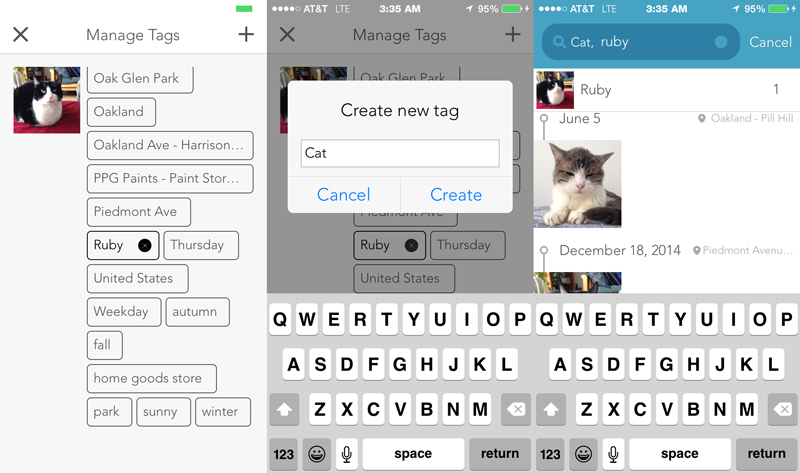 In experimenting with a pre-release version of the app, I found those tags plentiful — maybe even a little too detailed. One image I shot at the Lafayette Reservoir contained no fewer than 20 different tags ranging from the general — United States — to the specific, Lafayette Reservoir. Other tags included Weekend, park and Flag Day (yes, it was Flag Day — who knew?). Another image, of a California Golden poppy, had similar tags, mostly involving location and time, though never an identification of the flower itself, or even that there was a flower in the picture because right now the app relies on EXIF and other location, weather, and day of week types of data, as opposed to image recognition. For that, PicJoy lets you add tags to any image, though at this stage in the app’s development, tags that you add will not carry over to similar images. For example, I tagged my cat Ruby as Cat and also as Ruby. However, none of the other 20 pictures of her picked up that tag. A “machine learning” approach, where computer vision tech will start to recognize patterns and objects found within photos, is also coming soon, according to HitLabs co-founder Shane Bills. Small things were jarring: some tags ran too long for the space and were cut off with ellipses. When searching for times like Night, the app obviously clocked to my current time zone rather than the time zone when the photo was shot. Weather like Sunny brought up shots that were taken indoors. I could not remove irrelevant tags. 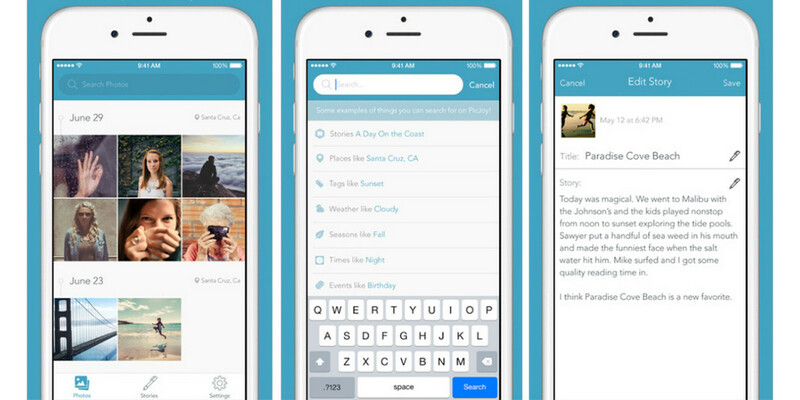 But PicJoy isn’t just about search — once you find your photo, you’ll want to share it with someone or perhaps just call it out for yourself. For that, the app offers a story feature lets you annotate selected photos to provide better context and memories surrounding a particular image. 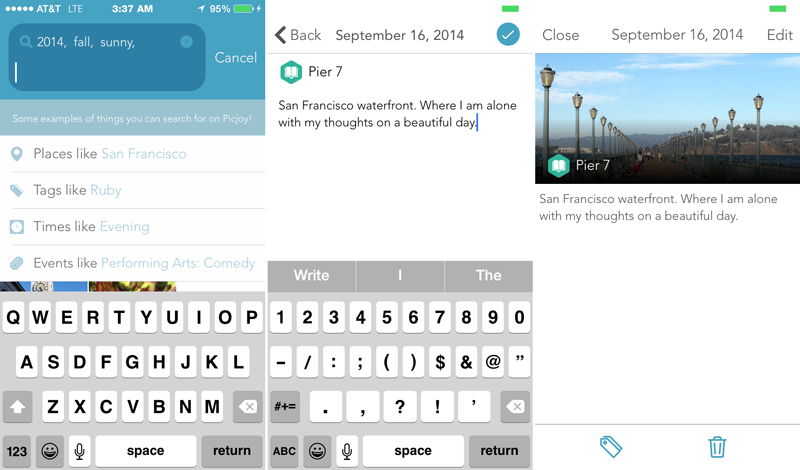 At the moment, PicJoy’s storytelling feature is nothing more than a single photo and a caption of any length you choose. There’s nothing wrong with that — I’m quite fond of photos and captions — but it’s rather a narrow definition of storytelling. It would have been nice to have the option to add photos as a sequence, and Bills says that is likely to be added in future versions. Captions will also be used later as another part of the search algorithm. Story sharing capabilities will also improve over time. PicJoy preserves the privacy of its users by only storing metadata on its servers to organize your photos, not to use your information – the app scans a photo collection and applies tags, and thereafter photos are erased from everywhere but your phone. At launch, the app is compatible with iCloud, but other cloud storage integrations such as Dropbox, Google Drive and Amazon Photos are promised. PicJoy is a 1.0 app and definitely a work in progress. While its newness is revealed in some bare-bones features at launch, I look forward to the company filling in the gaps and making the app more flexible and complete. 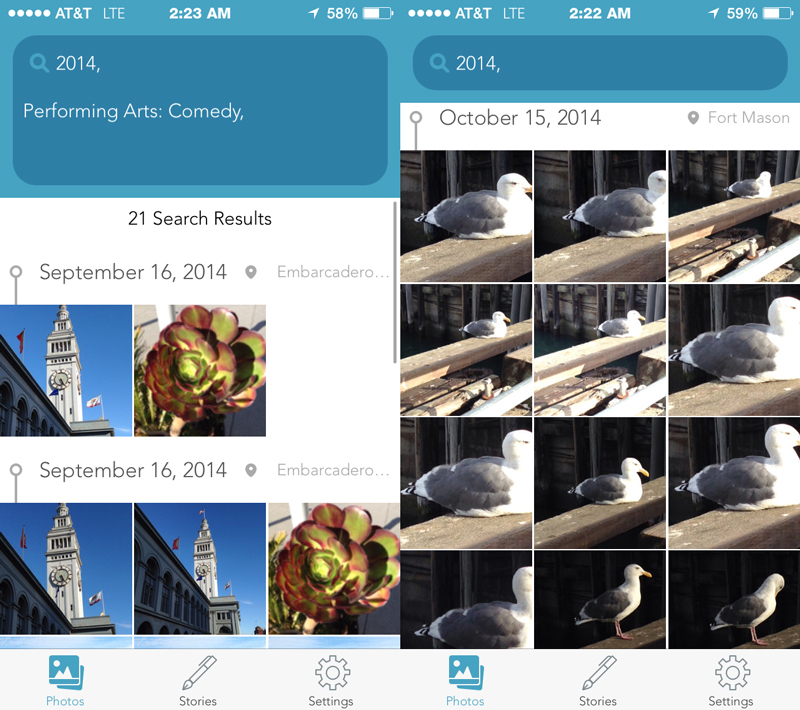 PicJoy is available for free in the iTunes Store and is optimized the iPhone 5, iPhone 6 and iPhone 6 Plus. It runs on iOS 8.